July | 2010 | 50 Westerns From The 50s. 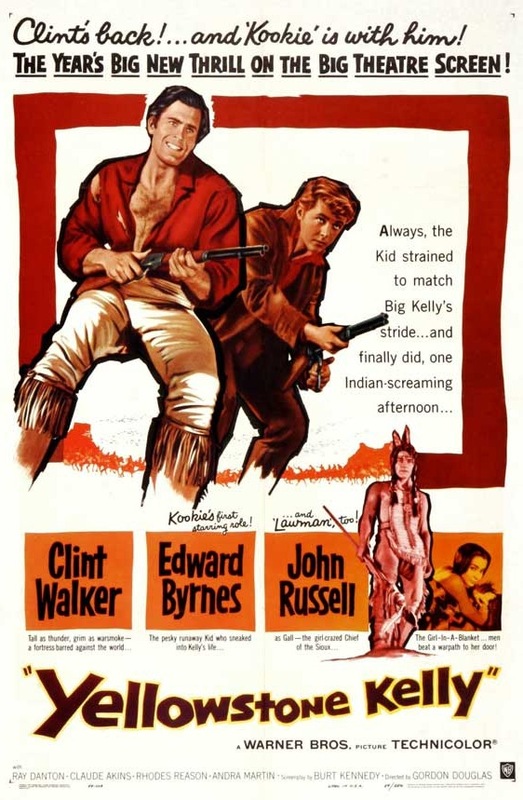 Warner Archive is offering the first 300 pre-orders of the new widescreen DVD-R of Yellowstone Kelly (1959) a copy signed by its star, Clint Walker. 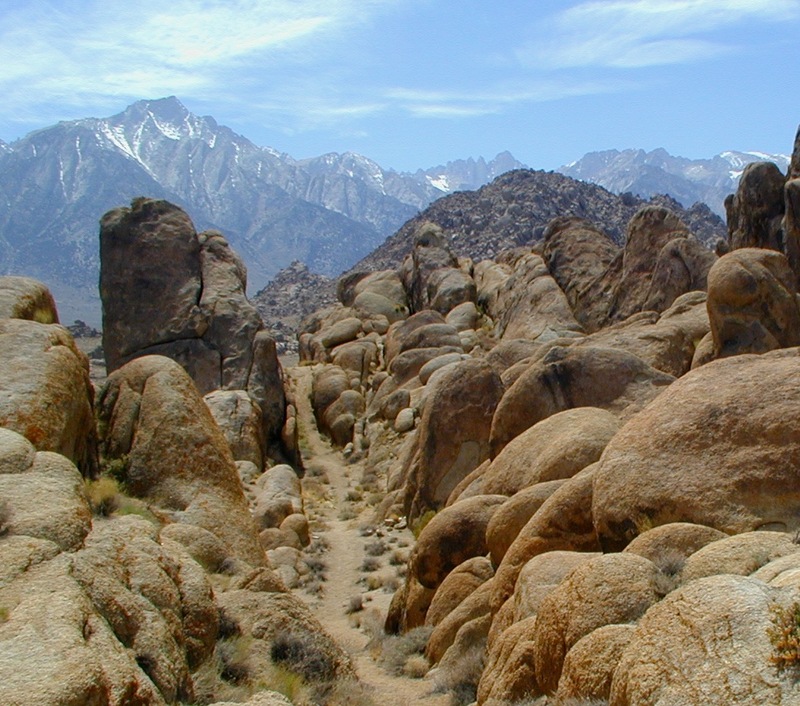 Laura from Laura’s Miscellaneous Musings was kind enough to send me a couple rocks from the Alabama Hills. For the time being, it’s as close as I’ll be getting to the locations for some of my favorite films — the Tim Holt RKO’s, a few Roy Rogers pictures, The Gunfighter (1950), Hangman’s Knot (1952), the Ranown cycle, and on to Tremors (1990). Thanks Laura, for helping these rocks make the 2,500-mile trek from Lone Pine to my desk. The image above was swiped from The Great Silence, a fabulous blog dedicated to film locations. It’s looking like we’re going to have to drill offshore for 50s Westerns on DVD. At least in this case, the more that gets spilled, the better. John Knight has pointed out a few titles that have been listed on Starscafe. Coming from Spain is Cattle Empire (1958). 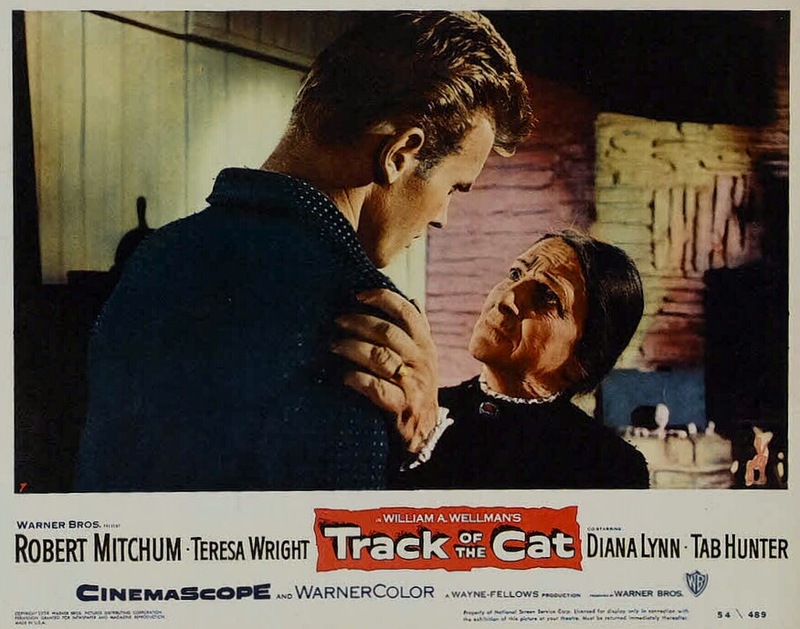 Written and directed by Charles Marquis Warren, this Joel McCrea picture feels a bit like a prototype for TV’s Rawhide, which Warren created the following year. Judging from the sample frame above (lifted from mundodvd.com — a click will enlarge it), our Spanish friends have used a transfer kind to Cattle Empire‘s ‘Scope image and DeLuxe color. I haven’t seen this film in years, and never widescreen, but I remember it’s one of those that McCrea turns into something just by being in it. 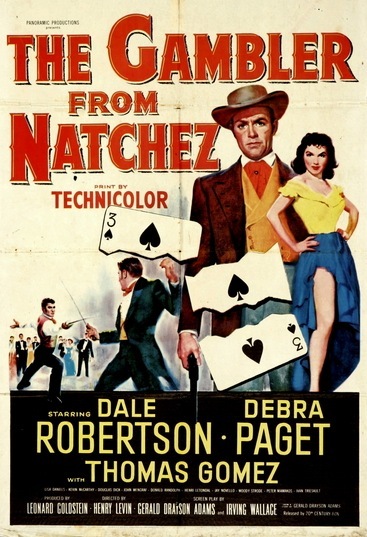 Also on the way (from Spain again) are Dale Robertson in The Gambler From Natchez (1954, maybe not really a Western, but who’s complaining? ), Fred MacMurray in the CinemaScope The Oregon Trail (1959) and Randolph Scott and Gene Tierney in Belle Starr (1941). Before William Castle had a skeleton on a wire, he had the winners of the National Indian Beauty Contest. 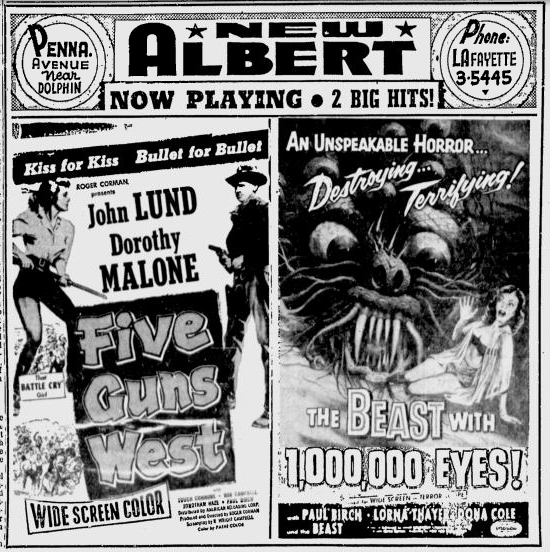 In 1954, William Castle was still a contract director at Columbia, cranking out cheap Westerns for Sam Katzman. (According to IMDB, a shaky source, eight Castle-directed pictures were released in 1954!) He was also four years away from producing his first independent picture, Macabre (1958), which insured the audience against death by fright — and made a killing. House On Haunted Hill, a masterpiece that dangled a fake skeleton over the crowd in a crucial scene (this was called Emergo), came a year later. Castle always gave Sam Katzman credit for teaching him the true value of showmanship (vs. actually having a good movie). 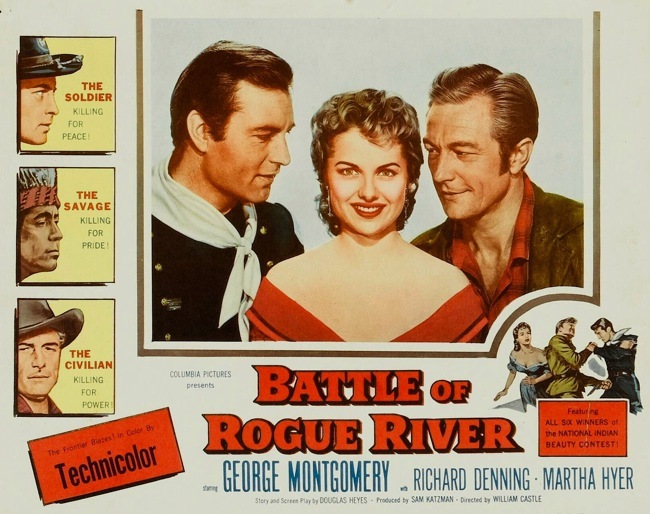 Battle Of Rogue River (1954) seems to be an example of one of those lessons. 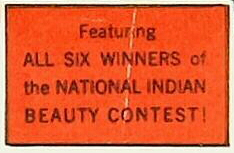 Produced by Katzman and directed by Castle, Rogue River plops “all six winners of the National Indian Beauty Contest” in the middle of its cast. I didn’t know there was a National Indian Beauty Contest. And I wouldn’t be surprised if it didn’t exist before Katzman and Castle came along. Saw a bit of an episode of The Waltons the other night, “The Conflict,” where Beulah Bondi played a mountain woman (Martha Corinne Walton) being tossed off of her land to make way for the highway. She was excellent in it, and looking her up, I found out she played the same character in a later episode — and won an Emmy for it. These were her last roles, a highlight in a career full of highlights (Mr. Smith Goes To Washington, It’s A Wonderful Life, The Furies). Anyway, this reminded me of Miss Bondi’s fine work in Track Of The Cat (1954). In a film known for William Clothier’s innovative cinematography and color scheme, and for the simple fact that John Wayne produced it, the performances often get overlooked. 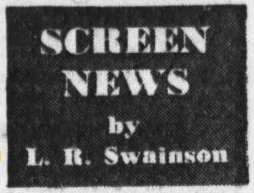 Came across an interesting article from The Age, back in October of 1955 — “New Twist To Westerns” from Screen News by L. R. Swainson — covering what was going on in the Western genre in the middle of the 50s. Brando and Pennebaker did indeed make a Western, One-Eyed Jacks (1961). It was based on The Authentic Death Of Hendry Jones by Charles Neider, not the L’Amour book. Stewart certainly suffers some physical degradations in that picture, but I’d hardly call them usual.